Completely Renovated Conv. 4 Bedroom with W/D Unit No Approval Required!This is 1647 SQ FT gut -renovated, 4th floor, corner apartment. An elegant entry foyer invites you into this pin-drop quiet, Conv. 4 bedroom 2 bath in one of the most beautiful Art-Deco buildings in the Hudson Heights. The apartment currently has 2 large living rooms which one can easily be converted into a full-size Bedroom. This grand home has East, South, and West exposures and in addition, all the windows are over-sized which makes this home extremely bright though out the day wherever you are!At the heart of the home is a large windowed kitchen with marble counter tops with an elegant, generous one slab backsplash, all new stainless appliances, earthy toned cabinetry and wide-plank cool-gray flooring. The Living/Dining room off the kitchen is large enough to hold both full sectional sofas and a formal dining table and chairs for 8 plus people. This room has a beautiful view of Bennett Cliff which sparkles when the sun light hits the surface.In case you missed, this apartment has its own Washer/Dryer nicely hidden in the wide hallway off the kitchen. Yes, no more hassle of dragging your laundry to the basement!In Addition to each of the 3 bedrooms having its own generous sized closet space, there are 2 walk-in closets and 1 linen closet within the hallway.Entire apartment is newly renovated with highly skilled craftsmen using luxurious materials throughout. Walls and ceiling are perfectly smooth with new skim coat and new hardwood flooring and ceilings have wood crown moldings. The master bathroom has elegant, vintage style black white French Bistro tile with impeccably restored original art-deco soaking tub surrounded by Carrera style marble wall with new fixture.This quiet home is perfectly situated on the high floor of a well-established Deco Co-op built circa 1920 with a resident superintendent, central laundry, bike room and private storage. Cats are welcome and 1 dog (under 20 lb) is allowed. 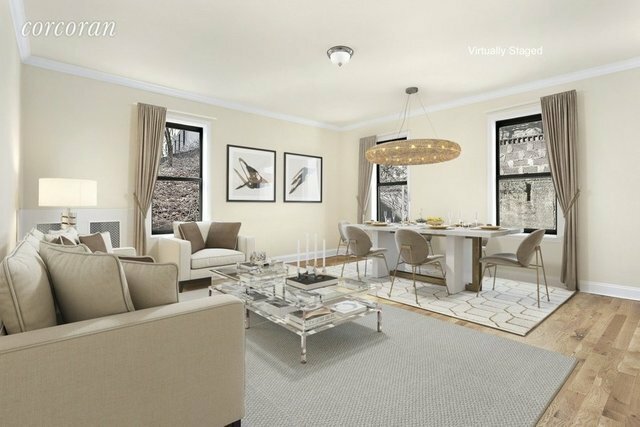 Convenient to BOTH Bennett Park and beautiful Fort Tryon Park with manicured flower gardens, walking paths and picnic area overlooking the Hudson River, as well as the Cloisters, nearby cafe and award-winning restaurants, Pilates, Starbucks and more. The express A Train is around the corner and takes you to Midtown in just 20 minutes. The M4/M98 express bus and #1 Train are also nearby. This neighborhood has a lots of nature, rich in history and so easy to commute to the downtown NYC NJ too. This is the meaning of quality living!